We all want to be unique. It’s in our nature as human beings to be more then just another teacher, journalist, mother, wife, etc. We make our individuality known in a variety of ways – our wardrobe, hair color, careers, jewelry to name just a few. It’s no surprise that couples want a wedding that helps them stand apart from the crowd. 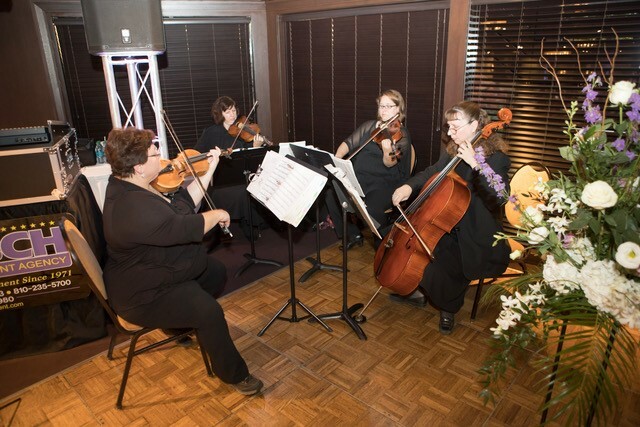 If you are looking for inspiration, consider using a STRING QUARTET and the wedding MUSIC as a means of making your wedding more then average. Music is a universally loved experience that conveys feelings and sets a mood. The music that you choose for your ceremony should be reflective of you and your fiance’s personalities and make a lasting impression on your guests. You no longer have to settle for the church organist/pianist and the traditional “Here Comes The Bride”. 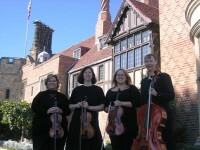 A string quartet offers endless options and the versatility for outside or inside venues. We don’t require amplification or special equipment. Just four chairs. If this sounds like an idea you’d like to consider – come see us on Sunday, November 12th at The Inn at St. John’s Bridal Show in Plymouth. We’ll be there from 1:00 – 4:00 playing a variety of songs from our playlist of 700 titles. We’ll have our calendar to check availability and will even take requests. 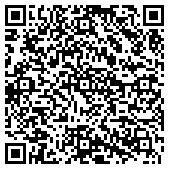 Come check us out and see why we have the received the following accolades. The Inn at St. Johns in Plymouth is home to the St. John Chapel, which offers a beautiful setting for Catholic weddings. The story of The St. John Chapel begins in the late 1940s when St. John’s Provincial Seminary opened its doors. In 1955, its remarkable chapel was dedicated. The Chapel is noted for its exquisite interpretation of early Italian architecture, its Botticino marble statues, and the beautiful stained glass windows. This gorgeous backdrop provided the element of history and tradition for Christina and Sean’s wedding ceremony. We were delighted to work with two excellent coordinators from St. Johns. Ken and Stacey made a great team and provided the piano and vocal music for the ceremony. It’s always helpful to have the extra set eyes for cues and Stacey provided that assurance that’s always appreciated along with the gift of her beautiful voice. The carved wood and stone, large-scale mosaic, and marble inlays in the polished floor created an element of majesty for Christina and her bridesmaids as they processed to Bach’s Air on the G String and Pachelbel’s Canon in D. Deacon Bill Waldmann acted as officiant and spoke eloquently the joys and challenges of marriage. The floral bouquets, created by One Enchanted Evening, accentuated the pink of the girls gowns. Mike Staff Productions handled the music for the reception to follow. We’ve encountered them several times in the past month which confirms that their reputation as one of the best continues to grow. We send our best wishes to Sean and Christina as they begin their lives together. The urge to applaud occurred several times during the wedding of Kristin and Scott earlier this month at St. Andrew’s Episcopal Church in Ann Arbor. Several of her friends sang and it was evident that these voices were the product of years of training. As four classically trained musicians ourselves, we thoroughly appreciated the Patrice Seibel’s “Ave Maria” by Bach/Gounod, “Pie Jesu” sung by Alexandra Brock and Anne Horak. Stephanie Layton and Alex Michaels sang a lovely version of “Morning Has Broken” and the ever beautiful, “The Prayer”, sung by Felipe Gonzalez and Jen Sese. In addition to these beautiful songs, Kristin and Scott selected great pieces for us to play including Debussy’s Claire DeLune, The Flower Duet by Lakme and Rhapsody on a Paganini Theme by Rachmaninoff. 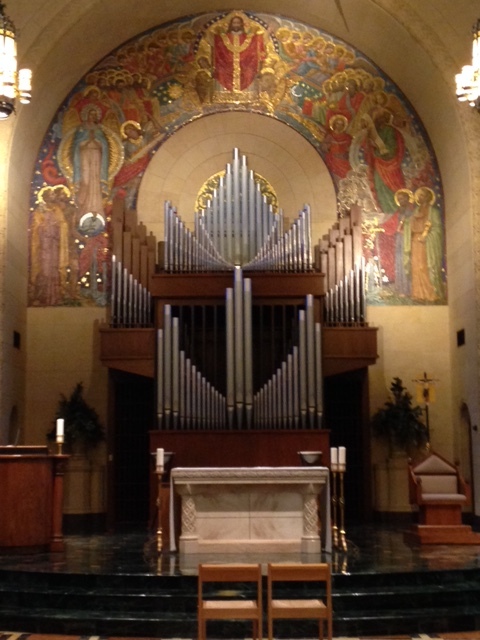 We played the traditional Bridal Chorus and Wedding March with Dr. Joy Schroeder on organ. It made for a majestic processional and recessional. The bridesmaids were in tasteful floor length gowns and carried sprays of calla lilies. It was an elegant affair. The elegance continued at the reception, held at The Inn at St. Johns. We had the pleasure o f playing for the cocktail hour and per Kristine and Scott’s wishes, performed many Gershwin pieces, Sinatra and other old jazz standards. Her guests were a lot of fun and we heard several singing along! The dinner was held in the beautiful atrium and guests enjoyed the evening with the high energy music of the Jerry Ross Band. It was a night to remember for the newly married couple and their guests. We wish Kristin and Scott the very best as they begin married life together. Congratulations to Pranita and Amar who were married October 31st. Their cocktail hour and reception was held at The Inn at St. John’s in Plymouth which provided a fairy tale setting for her special day with its majestic stonework, polished marble floors and soaring inlaid ceilings. They hosted over 400 guests for a cocktail hour in the gorgeous Garden Gallery room that was decorated with gold satin covered chairs, beautiful hydrangea and rose floral arrangements, a delicious looking dessert table by Sweet Dreams and an aromatic assortment of hordourve such as Baby Corn Wrapped in Manchurian Sauce, and Samoa’s. We performed a wide variety of music that included Vivaldi’s Four Seasons, California Dreamin’ and Coldplay’s Viva La Vida. The guests also enjoyed hearing the National Anthem from India along with the bride and grooms alma mater songs from The University of Michigan and UCLA.